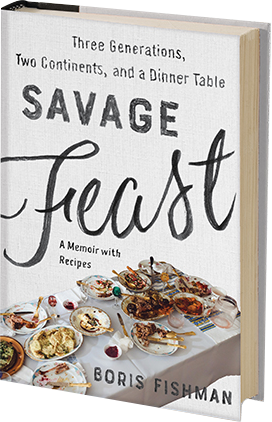 Savage Feast: Three Generations, Two Continents, and a Dinner Table (A Memoir with Recipes) was published in February. Find Boris's upcoming appearances here. Boris' prevous two novels, Don't Let My Baby Do Rodeo and A Replacement Life, were both New York Times Notable Books of the Year. Both are out in paperback. Savage Feast is one of Amazon's Best Books of the Month. The New York Times calls it "a tightly-written page turner," and The Wall Street Journal, The Washington Post, Vanity Fair, and Publishers Weekly agree: “Fishman’s immigrant saga masterfully evokes a family that survives, united by food." Here's Boris on NPR's Morning Edition and in Saveur. Details here. An introduction to Chekhov: Stories For Our Time, excerpted on LitHub. + "My Daughter's America - And Mine," in The New York Times (Sunday Review). + "The Last Thing He Taught Me, and the First Thing I Learned," in Tablet Magazine. + Returning to Vienna for the first time since immigrating through it 30 years before, in AirBnB Magazine.